The show’s season one finale, “On Henry David Thoreau of Concord, Mass.,” was released Thursday, Sept. 6, and features Laura Dassow Walls, William P. and Hazel B. White Professor of English at Notre Dame. She is the author of Henry David Thoreau: A Life, published in 2017 by the University of Chicago Press. Walls received fellowships from both the John Simon Guggenheim Memorial Foundation and the National Endowment for the Humanities in support of her work on the book, the first full-length, comprehensive biography of Thoreau in a generation. Earlier this year it was awarded the Los Angeles Times Book Prize for biography. In the course of their conversation, Walls and host Ted Fox explore the many sides of Thoreau: writer, abolitionist, leader in the Transcendental religious movement, and so on. Just as importantly, though, it becomes clear there is one thing that he was not: the Walden Pond hermit of our imaginations. You can visit provost.nd.edu/podcast to learn more about the podcast, including how to find it on iTunes/Apple Podcasts, Google Play, Spotify, and Stitcher. You can also search “With a Side of Knowledge” in your favorite podcast app or listen to the episode with Walls using the player below. 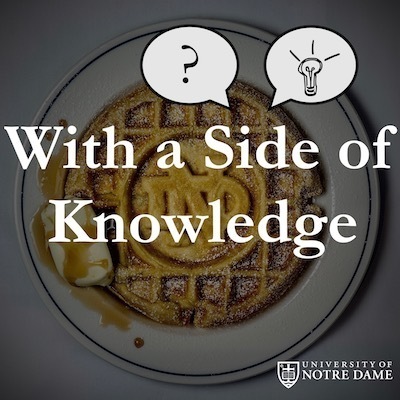 Originally published by Ted Fox at provost.nd.edu on September 06, 2018.